We have all seen the phone commercials where a person straps on a virtual reality headpiece and freaks out over the reality part. The person in the commercials waves at things that aren’t really there and ducks at things coming at them that aren’t really there, exclaiming “whoa” or “wow” all the while. The commercials are fun and probably really help in selling phones. However, there is a lot more that virtual reality can do and it goes way beyond just being neat. 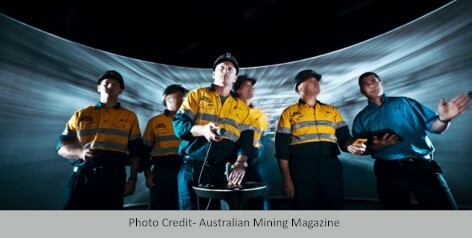 Australian Mining Magazine published a piece in 2015 that explains the way beyond neat part of virtual reality. Mines Rescue; a training organization in Australia is known across Australia for its training courses that include training at heights and in confined spaces, but now are also known for their virtual reality training platforms for miners. The company’s virtual reality training takes place in an immersive theater that provides a 360-degree view of a mine and the area around it. Coal mining is one of the most dangerous professions. When things go to the bad, the miners are really their own first responders; they have to be, when considering response times for trained fireman and other responders from the community. Regular training just cannot accurately replicate dangerous conditions like underground fires and gas explosions; that’s where virtual reality steps in. By training in the immersive virtual reality theater, Mines Rescue puts miners in those dangerous conditions without risking life and limb and trains them on how to deal with fire and/or explosion in a virtually realistic environment that replicates the conditions. In the article, Steve Tonegato, State Operations Manager of Mines Rescue, explained, “You can’t light fires underground, you can’t have smoke coming at you, and you can’t put people in high pressure situations in real mines where they have to make decisions, but you can do that here. Mixed reality is something that is very unique. People see a lot of virtual reality, especially in gaming which has sensational graphics, but this is a place where not only does everything look real, but you can also interact." In the virtual reality simulator, assets and equipment that are to scale, can be moved in and around the mine. In the scenarios, Mines Rescue personnel set them on fire, create accidents, create smoke and the like; replicating an actual scene; all to give participants a full emergency situation that they not only see, but really experience. Several points of view are available as well that add to the reality of the experience. During the training, participants can see the mine from inside the walls, behind the longwall, from the roof, to name a few. This is very important and provides a true and complete picture of the intricacies of a mine, providing much more information than one would gather without it. With this capability, when first responders arrive at a mine accident scene the scene commander can make better informed decisions about where to place teams, the dangers they may face and places they cannot or should not go. Various disaster scenarios can be played out in virtual reality. For instance, in the article, the author describes a scenario where a miner ruptures a methane pocket and the simulated scene fills with smoke. She says the scene was so real that because of the 3-D glasses she was wearing she was tempted to wave away the smoke that wasn’t really there. This capability, along with the others, provides the realistic component that makes training effective. At the Ready encourages readers to click on the link in the footnote and read the article themselves.